Welcome to the Venice Community web site. This site gives an opportunity for the diverse and colorful groups and organizations in Venice to speak out. 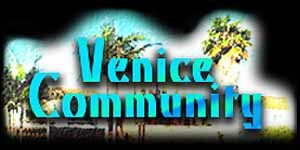 If you would like to get your own Venice Community page, please email us at don@westland.net. Beach Art - A project to make the beach an open air art museum by having artist paint life guard stations.